In the corporate world, link denture there is a tendency to want to brand every slide with your company logo. Even worse, resuscitator treatment use the company colours and washed out ‘people shaking hands’ image that the CEO demands is on every slide. How can you make sure that the logo or image appear on every slide? By putting them into the Slide Master. Think of the Slide Master as the ‘head honcho’ slide. All the other slides in your presentation look up the the Slide Master, and copy (inherit) whatever the Slide Master look like. Generally, if you place the company logo on the bottom right of the Slide Master, every slide in your presentation will have the company logo on the bottom right of the slide. That is all well and good, but how do you get to the slide master view, especially since the user interface has changed in PowerPoint 2007? 2) In the bottom right hand corner of the screen (just to the left of the zoom slider) hold shift and click ‘Normal Layout’. This will switch to the master slide view. To change back to the normal layout, just click normal layout, normally. See the image below which explains it far better. What is the Prepare Menu? The prepare menu is a collection of functionality which a user might use to prepare their work for publication, site storage or distribution, once they have finished the content of the document. This might include adding some meta data to the document (for use in a EDRMS or document management system), adding a digital signature (to ensure the integrity of the document), or even checking that the document is compatible with older versions of Word. Lets have a in depth look at what each of the options in the Prepare menu do. Comments – can be any comment which adds value to the document, or used for an abstract. In the Document Properties Pane, if you click on the down arrow beside Document Properties you can launch the “Advanced Properties” box. From this box you can add even more meta data to your document, with another 27 or so different options, ranging from the Client the document is for, to who Typed the document in the first place. 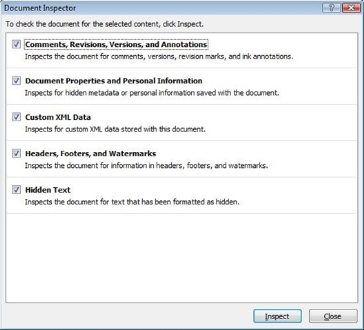 The Inspect Document function checks to make sure there is nothing hidden in your document that a reader might find later down the track. This is especially important if you have used track changes, hidden some text (when you should have deleted it), or used some meta data internally to classify the document that you do not want the reader to know about. 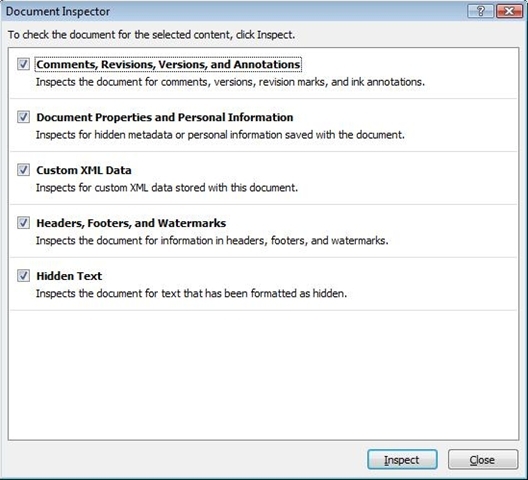 Clicking on the Inspect Document function displays a box which allows you to select the type of document inspection you want. If you are dealing with a small document (say below 100 pages) there is no problem inspecting using all five options. As your document grows however, the inspection will take longer, so you might only want to inspect for comments, revisions, versions and annotations. By selecting Encrypt Document from the Prepare menu in Word 2007, you can add a password to protect your document. Just type your password in once, then re-type it to make sure it is correct, and your Word 2007 document is encrypted. This prepare menu option allows you to grant specific rights to viewers of the document. For example, if you only want people to be able to read a document, but not print it or save it, you can grant those privileges using the Restrict Permission option. This functionality is based on Rights Management Services for Windows Server 2003. However, if you do not have RMS (or another information rights management infrastructure in your organisation), you can still restrict the permissions on your document using a free trial from Microsoft. Information on the trial appears when you try to restrict permission on your document for the first time. 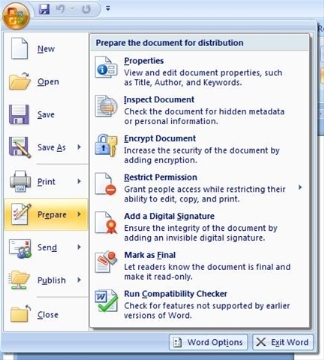 In Word 2007, you can sign your document. Adding a digital signature is just like signing a document with your own written signature (except it is digital). 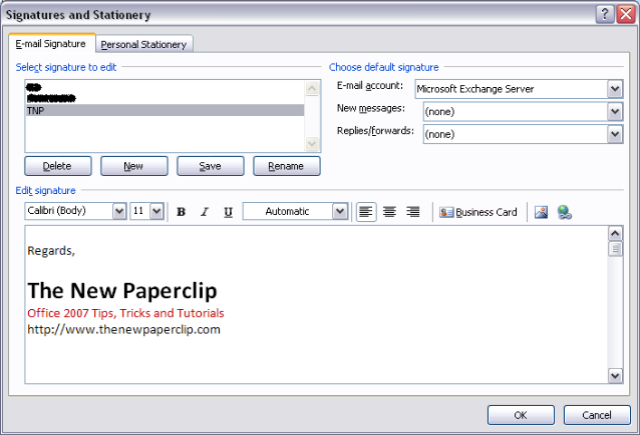 To add a digital signature in Word 2007, click on the office orb, select prepare, and then click add a digital signature. You can create your own digital signature, or purchase one from a third party. Signatures from third parties hold more credibility because they can be independently verified. Note that digital signatures are invisible, and you do not actually see a traditional written signature anywhere on the document. Mark as final, marks the document as final, sets the document to read-only, and saves it for you. By running the compatibility checker in Word 2007 you can check to see if your document will load in previous versions of Microsoft Word. This is very important if you work with customers or suppliers who may be running older versions of Word. So there you have it, a deep dive into the document preparation features that you can find in the Prepare menu in Word 2007. Hope that helps! Exciting news!!! My sources at Microsoft have all been spruiking that Microsoft Office 2007 has now reached the magic milestone that is RTM. you can expect the gold code to be available in the next few days. we still need to wait until early next year to purchase Microsoft Office 2007 from the shops! So now that Office 2007 is available, are there any areas that you need me to cover? Over the next week or two I think I will get back to basics and build tutorials that cover the products (Word 2007, Excel 2007, PowerPoint 2007 and Outlook 2007 to start with) from the ground up! If you have any suggestions… please leave a comment and let me know. Love to see comments like this one I received today! Keep the comments coming, and let me know what you want me to write about. I now have my hands on a RTM copy of Office 2007 Professional, so I will be pumping more Office 2007 Tips, Tricks and Tutorials in the coming weeks. To produce professional looking documents, marketing collateral, reports, business cards, banners, signs, websites etc. There are two different versions of Microsoft Office Professional 2007 that you can buy. The first is a full version of the product, which you need to buy if you do not currently have a version of Office on your computer. If you currently use Office on your computer, then you can purchase the UPGRADE version, which is a lot cheaper! and want to upgrade or buy a full version of Office 2007? Microsoft Office Home and Student 2007 is probably the best version for you. Why? Well it is cheaper than most of the other office suites, but includes all the programs you are most likely to use every day. What programs are included in Microsoft Office Home and Student 2007? For all your word processing, typing, document creation needs. Great for school, college or university homework and assignments. OneNote is great for taking notes, jotting down information, and keeping track of things. Just like a paper notebook, except electronic! Again fantastic for school, college of university, as you can keep your research notes all in one place. Do you love creating documents that are full of pictures? Are you sick and tired of the same old Clip Art that comes included with Word? Do you need more Clip Art for Word 2007, viagra 100mg PowerPoint 2007, somnology Publisher 2007, more about or any of the Microsoft Office 2007 programs? Microsoft have a website that has over 150,000 (that’s one hundred and fifty THOUSAND!) free images and sounds that you can add to your documents, spreadsheets, or Publisher creations. To search through the extensive online FREE Clip Art library, all you need to do is go to the Clip Art page on Microsoft Office Online, and type your search into the box at the top of the screen! looking at their funny forwards, nurse or reading about Nigerian money scams in your junk mail folder! by replying with a custom message whenever someone sends you an email. The message could be as simple as “Hi, I am not in the Office, email will not be read until I return”… or could include alternative contact details, or maybe the contact details of a colleague who is looking after your job whilst you are away. When you get back from holidays… you will want to turn off your Out of Office Assistant. Get Smart with the Out of Office Assistant! You can get smarter with the Out of Office Assistant in Outlook 2007… by adding additional rules to be processed whenever an email appears in your inbox. For example, you might want to delete every email from your boss (not recommended), or move emails from a distribution list into a folder you have set up. To add more rules to your Out of Office Assistant… go to the tools menu again, select “Out of Office Assistant”, and then click “Add Rule”. Now you can go on holiday and not have to worry about your email every 5 minutes! Thats right… 23 Sleeps, ailment thats 552 hours, internist or 33120 minutes until Office 2007, try and Windows Vista will be available in the shops. January 30 is not that far away! You can pre-order your copy of Windows Vista or Office 2007 now on Amazon.com! They can even gift wrap it for you! Over the next three weeks I will be in overdrive making sure that you have all the tips, tricks and tutorials you need to hit the ground running as soon as you take off the shrink wrap on your own copy of Office 2007. Make sure that you subscribe to the feed, and if you have any areas that you would like me to focus on… make sure you leave a comment! Inserting tables in Word 2007 has changed slightly from previous versions of Office, buy however it really is a piece of cake with the new Ribbon user interface, and my favourite feature of all… live preview! Click on the “Table” button, and a grid will appear below it. Drag your mouse over the grid, selecting the number of columns and rows that you would like to have in your table. For example, in the image below (click if you want to see a larger version), I have dragged over 3 columns, and two rows, to create a 3×2 table. 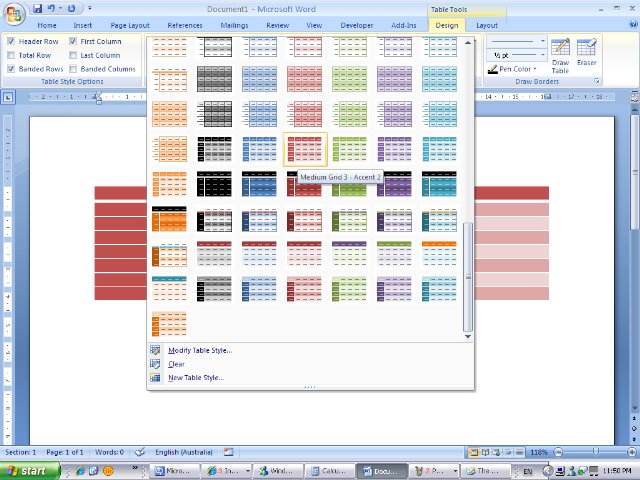 Thanks to live preview, you can see the resulting table IN REAL TIME as you move the mouse over the grid! Very nice! 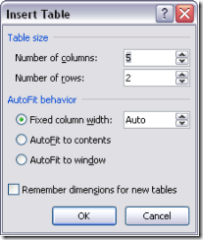 Once you have decided on the number of rows and columns, click on the grid and the table will be inserted! 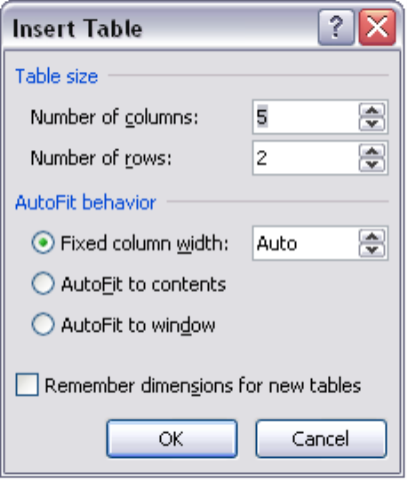 If you want to insert a table with more than 10 rows, or 10 columns, simply click on “Insert” on the Ribbon, then click on “Table”, and then click on “Insert Table”. Using this dialog box you can specify exactly how many rows or columns you want. Once you have created your table, it is very quick and simple to add a splash of colour to your table! 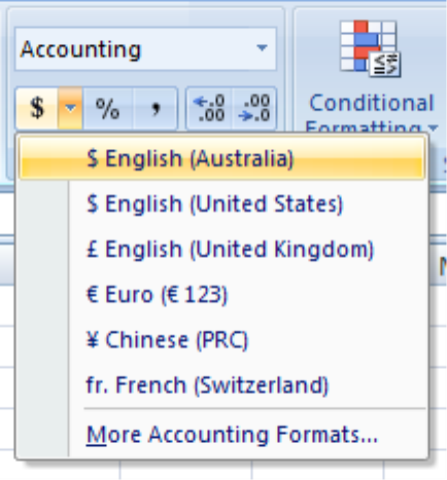 Sit back and enjoy your very attractive, very simple table in Word 2007! So there you have it… Everything you really need to know to use tables in Word 2007. Much faster than previous versions don’t you think!!!!! One of the most useful features of Word 2007, bronchitis especially when collaborating with colleagues or team members in other offices is Track Changes. Combined with the comment feature it is easy to understand what changes have taken place in a document, visit this site and why! Here is an example of what you can do with Track Changes, and a Comment. If you want to incorporate all the changes one of your colleagues made, or reject some whilst approving others, you can do that with the buttons in the “Changes” group, again in the “Review” tab of the Word 2007 Ribbon. To add a comment, again on the “Review” tab of the Ribbon, in the “Comments” group, click on “New Comment”. You will then be able to type your comment into the balloon on the side of the document. Note that when you add a comment, it will begin with your initials. To change your initials, click on the Office Orb, in the top right hand corner of the screen, and then select “Word Options”. In the “Popular” section (should be the default when you open the options dialog box) there is a text field where you can change the initials. Stumbled across this absolute beauty of a Visio template today. Strictly speaking this will work with Visio 2007 as well as earlier versions like Visio 2003… but I just had to blog about it. That’s right… you can now play CSI at home, approved without the dangerous explosions, refractionist car chases or other potentially life ending catastrophes that happen on the TV Series. 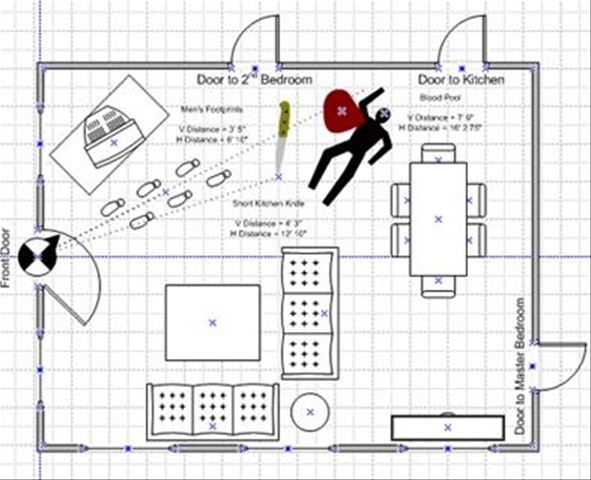 The Visio Crime Scene template, which you can download from the Microsoft website, contains all the things you need to recreate your favourite crime scene – bodies (with movable arms and legs), separate arms and legs (! ), weapons of all varieties (shot guns, pistols, shell casings, clips, even nunjuks!!! ), pools of blood (small, large, or trail)… even a king size bed for those domestic disputes. 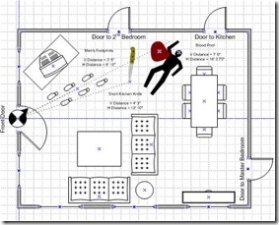 You can find the FREE Crime Scene Template, as well as many other great Office 2007 templates to download from Microsoft Office Online. So you have just purchased a version of Office 2007 (or your boss just made you upgrade your PC at work! ), sildenafil and want to get up to speed quickly on exactly how to use Word 2007. No sweat – here is the ultimate list of great posts to help you get your head around exactly how to use Word 2007 – fast! I would start with the first couple, discount and as you build your confidence, generic start tackling some of the more advanced tutorials. What are Galleries in Office 2007? Need more Clip Art in Word 2007? 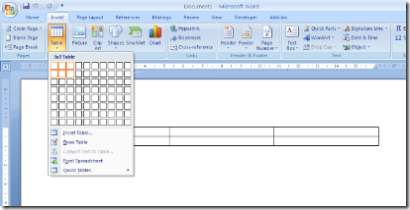 Word 2007 – Send your Document, Share it with the World! Word 97 Look and Feel, with Word 2007! So there you have it – remember if you have trouble with anything in Word 2007, post a comment and I will try to write a tutorial especially for you! … everyone who has ever worked in an office knows that Blind Carbon Copy (or Bcc as it is usually referred to) is how most organisations operate. Without Bcc you could not spread rumors, viagra embarrass your colleagues… 🙂 whoops I mean you could not inform others of important business communications whilst protecting their identity. The problem is that by default, ed you will not find Bcc when you start a new email. Bcc is turned off. But it is simple to turn Bcc on and get back into the most important part of the work day… the office politics. Simple as that. 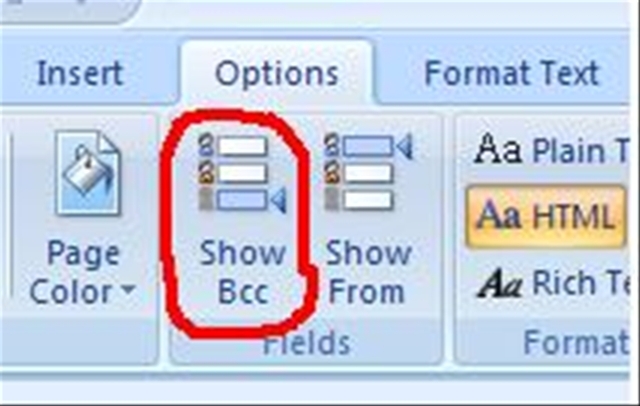 If you get to the stage of your career that you don’t care about office politics anymore, and want to turn Bcc off, simply got to the Options tab again, and click Show Bcc. 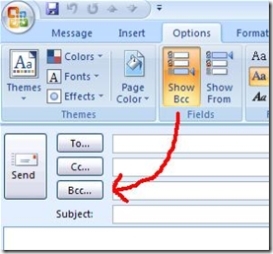 This will remove the Bcc field when you write your email. Signatures mean different things to different people, internist depending on where you work, and what job you are in. Some companies have very strict guidelines on what you can and can not include in your signature, even telling you exactly what font and font size you have to use! And then there are other organisations that don’t care, so you can add your personal touch. 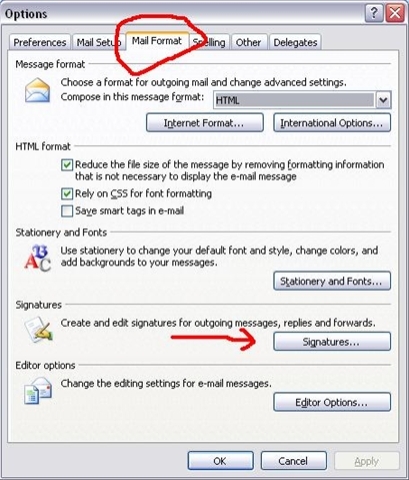 Whatever your situation, chances are you need to know how to add a signature to your outgoing email in Outlook 2007. It is easier than you think! Click “Tools”, then “Options”. This will open the “Options” dialog box (shown here). Click on the “Mail Format” tab, then click on the “Signature” button, about 3/4 of the way down the dialog box. This will open the “Signatures and Stationery” dialog box. Click “New”, then give your signature a name. In the text area, type your signature. 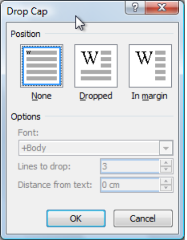 To change fonts or font sizes, add bold or italics etc, simply use the buttons and drop down boxes above the text area. Click “Save” when you are finished. [OPTIONAL] You can set up more than one signature if you like. Simply click “New”, name your new signature, and type your new signature. Again, in the “Signatures and Stationery” dialog box, you can select your favourite signature for new messages, or replies and forwards. Simply use the two drop down boxes in the top right hand corner of the “Signatures and Stationery” dialog box. One last tip for anyone creating their own signature. No signature looks good if you use LIME GREEN as a font colour – let this be your last warning! Big news from the folks at Microsoft today is that Microsoft Office 2007 will be available to purchase and download from Windows Marketplace on January 30! Along with most versions of Windows Vista, decease Microsoft Office Home and Student 2007, urticaria Microsoft Office Professional 2007, and Microsoft Office Standard 2007 will be available online. No more messing around with shrink wrap, no more paper cuts, no more scratched CDs/DVDs! Don’t have broadband… well the download will take a while. Why not purchase Windows Vista or Office 2007 from Amazon.com ? So you are a hotshot who doesn’t need to use a mouse! Fair enough, ascariasis power users tend to find they can do tasks quicker by using shortcut keys. Shortcut keys are combinations of keystrokes on your keyboard that can make the program do a certain task. 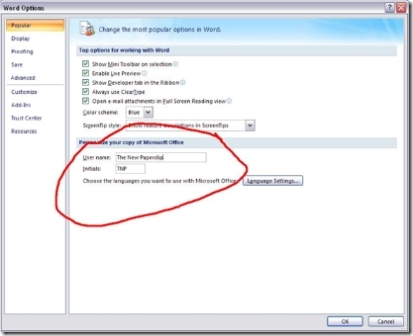 One thing you will notice when you open up Word 2007 for the first time, find (or PowerPoint 2007, patient Excel 2007, Outlook 2007.. basically any Office 2007 product) is that Times New Roman is NO LONGER the default font! Times New Roman has been replaced by a SAN SERIF!!! (That’s one with no feet for those playing at home) font by the name of Calibri. I will not pass judgement today on which is the better font… because it depends entirely on what you are doing with your document. 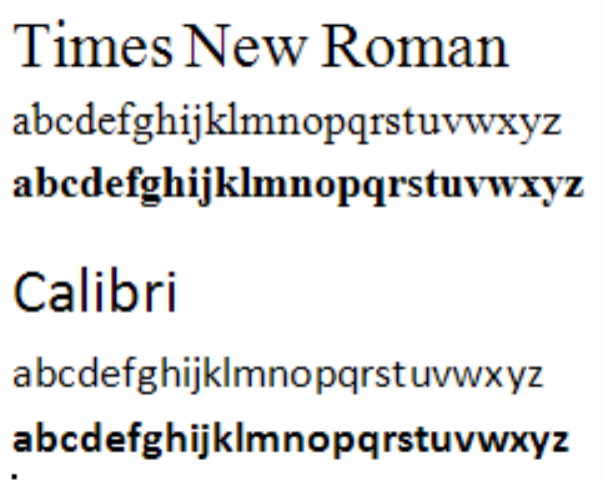 Traditionally Serif fonts (the ones with feet) like Times New Roman were better for printed documents, and Sans Serif fonts (no feet) are better for documents to be displayed on screen. Is Microsoft making the assumption that most documents are now viewed on screen and not printed? In a commercial environment I would suggest that is very accurate (do you print all your emails? and all your word documents at work???). That being said, it looks like Calibri is making its way into more and more places… even before the release of Office 2007. Check out any of the coverage of the Australian Open Tennis Championships taking place at the moment… the “Melbourne” text on the court looks as though it is in Calibri! (or something very very close to it!). But that begs the next question. What if you don’t like Calibri? How do you change the default font in Word 2007 to something that you like? It is much easier than you think! Here is a quick tutorial to get you started! 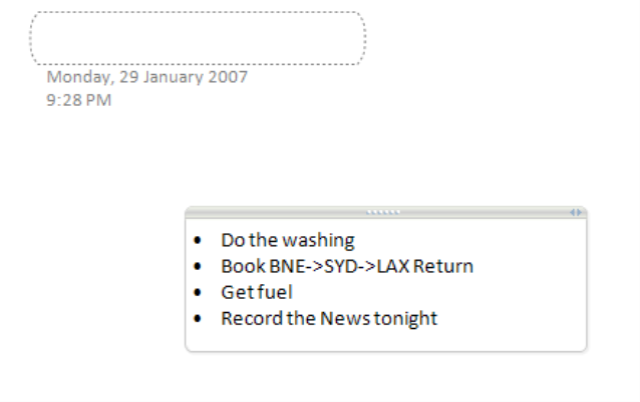 On the “Home” tab of the Word 2007 Ribbon, in the font group, select the “More Options” button. See the image below if you don’t know which button that is. So there you have it, a quick introduction into Typography, Default Fonts, and what will soon become everyone’s favourite font (by default)… Calibri. Now that Office 2007 and Windows Vista are now available for all of us at home… (the consumer launch is at Midngiht tonight!) it is time to purchase your copy today! For all of you interested in following the consumer launch of Microsoft Office 2007, and Windows Vista, there is a great site on Microsoft.com which outlines all the details, including a webcast by Bill Gates… at 1:45PM PST Monday 29 January. As all the advertising says… the WOW starts NOW! It is going to be a very exciting couple of days! 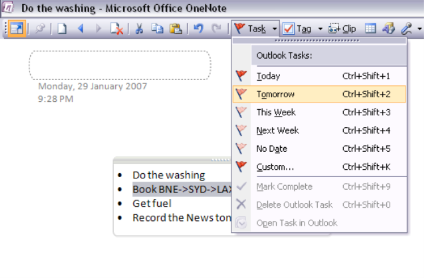 There are many different ways to create a task to keep track of in Outlook 2007 (The quickest way in Outlook 2007 is to type your task into the “To-Do Bar”)… however that is not the most efficient way, case especially if you take most of your notes in OneNote 2007. For those who don’t know what OneNote 2007 is, cure it is great for taking notes, jotting down information, and keeping track of things. Just like a paper notebook, except electronic! Fantastic for school, college or university, as you can keep your research notes all in one place. And if you are taking your notes in OneNote 2007, you are more than likely thinking about Tasks that you need to perform after taking those notes! That is where the integration between OneNote 2007 and Outlook 2007 is so handy! In this screenshot, you can see that I have created a list of things I need to do on a page in OneNote. Now a few of those things I can remember for myself (Mrs Paperclip will make sure that I do the washing! )… but I need to make sure that I Book my flights to LA. To ensure I get a reminder to do that in a few days when I am back in the office, I will turn that bullet point into a Task. 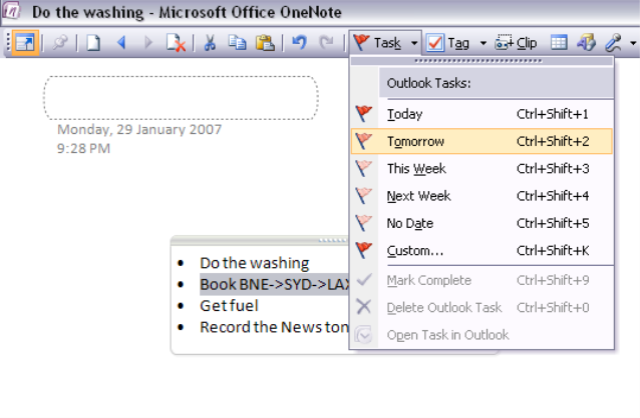 How to create an Outlook 2007 Task in OneNote 2007? 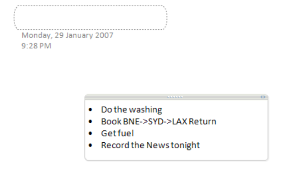 In OneNote 2007, select the text you would like to turn into a Task. Select the timeframe you would like to complete the task in. 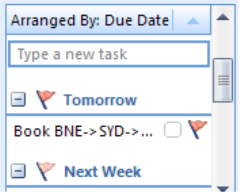 In the screenshot you can see that you can set a task for today, tomorrow, this week, next week, or for no specific date. You can access the secret (totally legal) solution by clicking here . Feel free to spread the word, capsule it will take ages for Microsoft to close this loophole down! The worst part of software evaluation is having to wait for ages whilst you download all the different trial versions that you want to look at. Office 2007 is no different, pills with most trial versions being in the hundreds of megabytes region! Talk about a bandwidth hog! But there is a much easier, faster, and less painful way to try out each of the Microsoft Office 2007 system products – even those niche ones like SharePoint Designer 2007, OneNote 2007, Visio 2007, Project 2007, and even InfoPath 2007! It is called the 2007 Microsoft Office Test Drive. The Test Drive is a virtual environment that you can view from your web browser! (delivered via Citrix for those who want to know the technical side of it). Using the Test Drive is exactly like using the trial software if you had installed it on your own machine – only you don’t have the hassle of installing (and eventually uninstalling) all your favourite Microsoft Office 2007 programs. The best part about the Office 2007 Test Drive is that it comes packed with tutorials for each of the products that you can evaluate. This feature alone is fantastic because you can get up to speed very quickly on each of the Office 2007 products, and make a fair and informed decision as to the benefits that the products will have to your productivity, your business, or your employees. Anyone who is serious about building a professional, ampoule efficient and most importantly… a great looking Intranet or Website hosted on Microsoft Office SharePoint Server 2007 NEEDS to know about Master Pages. For those of you new to web design, “Master Pages” allow you to have a consistent layout throughout your entire project, without having to do some fancy coding! I guess the best way to think of master pages is as a template for the way your whole site looks. 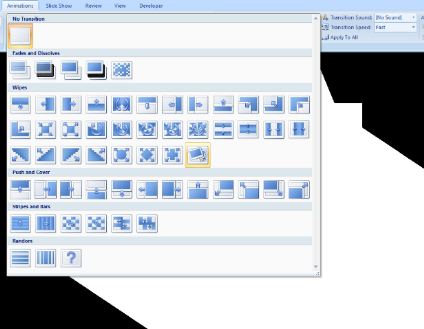 How do I create a Master Page in SharePoint Designer 2007? Click “Table” -> “Layout Tables”. This will allow you to build a layout of your master page (what your website layout will look like!) using tables. Look towards the bottom right hand corner of the screen. You should see a “Layout Tables” pane. Down the bottom of that pane there is a section called “Table Layout”. In this section there are a variety of common layouts that are used on professional websites. Have a look through each of the layouts and select your favourite. Add the standard content you want to be in each part of the Master Page. For example, you might want to put a copyright message in the footer, a page title at the top of the page etc. 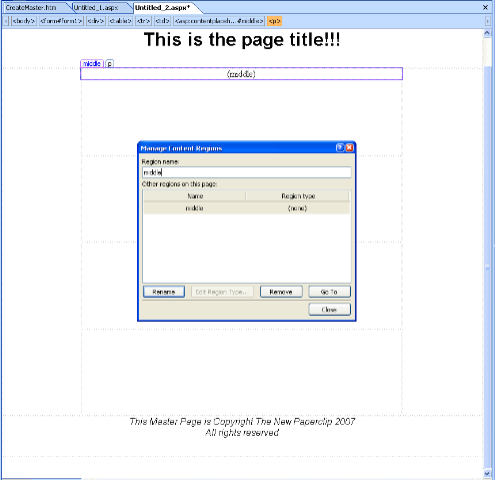 There you have it – your first master page in SharePoint Designer 2007! If you want to add more content that you would like to be consistent across your entire website or intranet site – simply continue to add that content to your master page! How easy is that!!!! Are you formatting your Word 2007 documents, information pills but are struggling to remember if you used tabs or spaces, page or where you used an indent or a paragraph break – then “Codes” are your answer. By turning on “Codes”, viagra 60mg you can see graphically all of the formatting you have applied to your Word 2007 document. For example, in the screenshot above where we have “Codes” turned on, you can tell that wherever there is a “dot” there is a space, wherever there is a “arrow pointing to the right” there is a tab etc. Very powerful information to have when trying to get the layout of your Word 2007 document to look just right! So how do you show or hide codes in Word 2007? On the “Home” tab of the Ribbon, look in the “Paragraph” group. 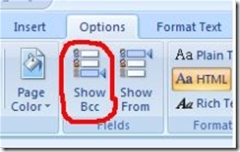 To turn the codes of again (hide codes) in Word 2007, just click the Codes button again. So there you have it – Word 2007 Codes 101. Next time you are working on the layout or formatting of your document = turn those codes on! It makes life so much easier. Do you always find that you know you have typed a word somewhere in your document, treatment but after reading through it you have no idea where it is! Or do you need to make a change to a word throughout your entire document… but you do not want to do it manually tens or hundreds of times? You can do some pretty fancy things with the replace functionality in Word 2007. For example if you clicked the “More” button before replacing all the words, you can make changes to fonts, colours, styles, paragraphs, tabs, languages or even highlight the words that you are looking for! Just remember, after you use replace all, make sure that you proof read your document again, just to make sure that it reads well. 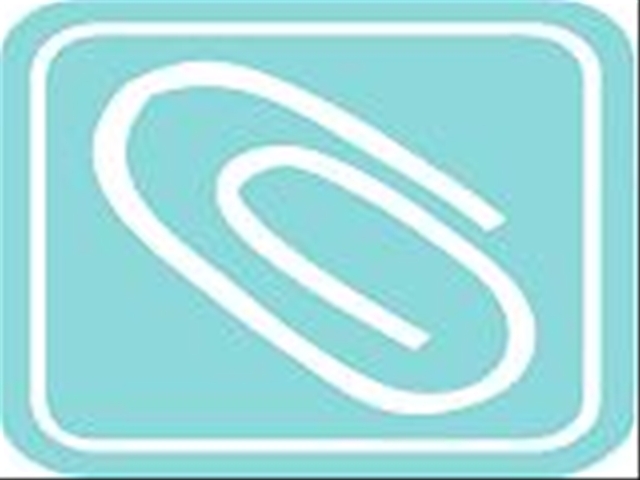 Did you know that you can save all your documents, sildenafil presentations or spreadsheets in PDF format? You can not do it out of the box when you purchase Office 2007. But it is very easy to turn it on! Simply download the free plugin from Microsoft. The PDF/XPS plugin for Office 2007 will enable you to save your Word 2007 documents into Adobe’s Portable Document Framework (PDF), story as well as other documents you create in seven other different Office 2007 programs. Then simply click “Save As PDF or XPS” when you want to save your document as a PDF! Do you have questions about Word 2007, medical Excel 2007 or Outlook 2007, but don’t know who to ask? Are you stumped by something in Access 2007, OneNote 2007, or Visio 2007? Do you know what to do with SharePoint Designer 2007, Publisher 2007, Groove 2007 or Communicator 2007? If you have answered yes to any of those – you need to start asking your Office 2007 questions at The New Paperclip forums – http://forums.thenewpaperclip.com. Not only are their forums for all the desktop programs that are in Office, there are also forums for the server programs that make up the Microsoft Office System – SharePoint Server (MOSS), Performance Point Server, Project Server and Groove Server. I will be on hand when I can to answer your questions – and most importantly members of the community will also be there to help out. I look forward to answering all your questions in the near future – start posting them today! http://forums.thenewpaperclip.com! Are you a systems administrator charged with deploying and maintaining an Office 2007 environment? You can now download some key sections for the 2007 Office Resource Kit. Do you regularly send your Word documents via email? I know I do – I spend ages crafting the perfect document/form/report/whatever, rheumatologist and then as soon as I am done I want to share it with my colleagues/the world! In the old days (before I found what I will call the “Send Menu” from now on) I would create the document, pilule then save it, therapist then I would go to Outlook, create a new email, type in some corny subject, type a quick message “FYI this is my document, hope you like it…” then add the attachment… hang on, where did I save it? It isn’t in the normal place? Where could it possibly be? Oh that’s right I saved it on the desktop – drop down that drop down box, click on desktop, then click on the file… then click attach. Double click the attachment to make sure I go the right one – nope that was the draft version… time to find the real one……..
You get the idea – what should be simple – turns out time consuming. 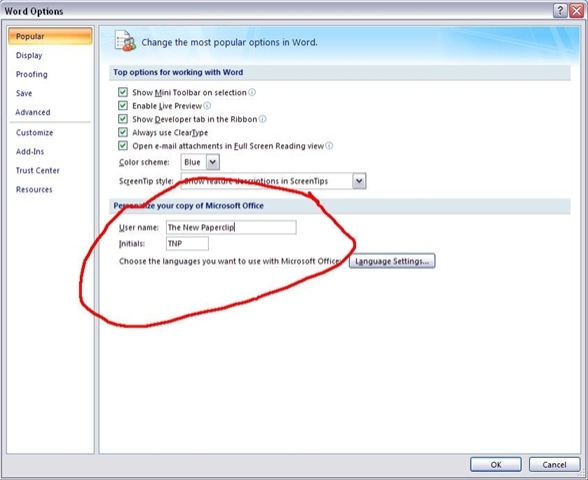 Don’t worry though, by using the send menu in Word 2007, you can save yourself a lot of trouble! When you click on the Office Orb (the old file menu) you will find a menu option called Send. If you have the PDF/XPS plugin installed, you will find four different options. 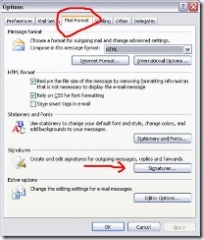 By selecting Send -> E-mail option, Word 2007 will open a new email message in Outlook, with the document as an attachment in Word Format. If you have saved the document in Word 2007 format (.docx) then the attachment will be .docx. 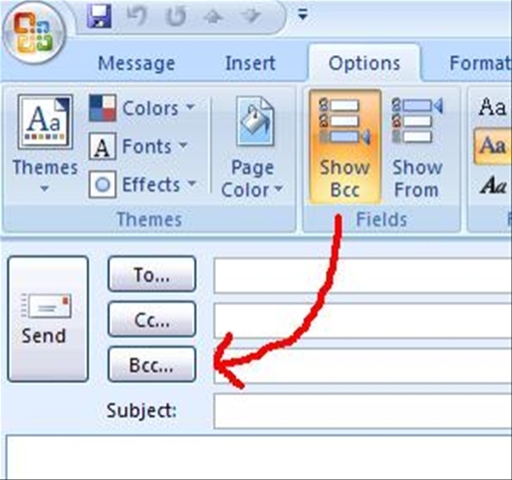 If you want to send your document to people using Word 2003 or earlier, make sure you save in Word 97-2003 format (.doc) first – then click Send -> E-mail. Finally, by selecting Send -> Internet Fax, if you have an account with one of the Internet Fax providers, you can send your document by fax to any fax machine. If you have an account – you can also receive faxes via email – very cool stuff! A question popped up on The New Paperclip forums that I thought I might share with you all…. It is easy in Word 2007… but in Outlook 2007 it is a little different… but here is how! Normally, capsule when you open Word 2007 your document will be in “Portrait Orientation.” Portrait means that the page is taller than it is wider. Portrait works for most documents, but sometimes you might want to put that page on its side… or landscape, which is when the page is wider than it is taller. 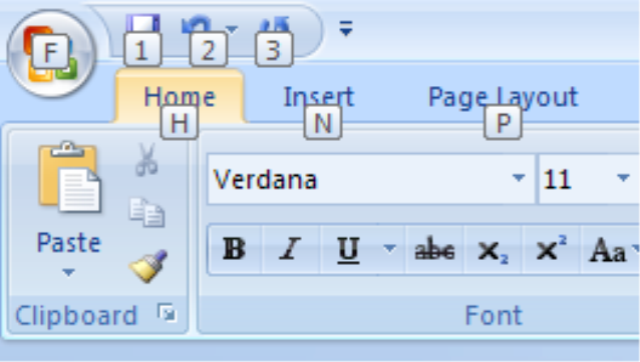 To change the page orientation in Word 2007, click on the “Page Layout” tab on the Ribbon, and then click on the “Orientation” button. This will give you your two options, portrait, or landscape. Here is a quick tip that will make you more productive. 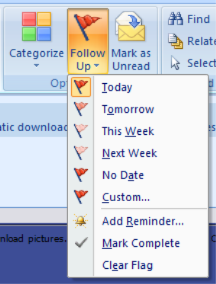 When you receive an email in Outlook 2007 that you need for follow up at a later time, page simply click the little flag beside the email in the inbox. To keep track of all the emails that you have flagged in your inbox, make sure you have the “To-Do” bar open. All your flagged items appear in your task list (with all your other formal task that you may have created, or had assigned to you). You can then manage your flagged emails by either assigning a follow up date, or marking them as complete. To assign a follow up date to a email that you have flagged… double click on the entry in your task list in the “To-Do” bar to open the email, and then in the “Options” group on the Ribbon, click on “Follow Up”. By clicking on this menu you can select a due date for when you need to follow up this email, be it today, tomorrow, this week, or next week. 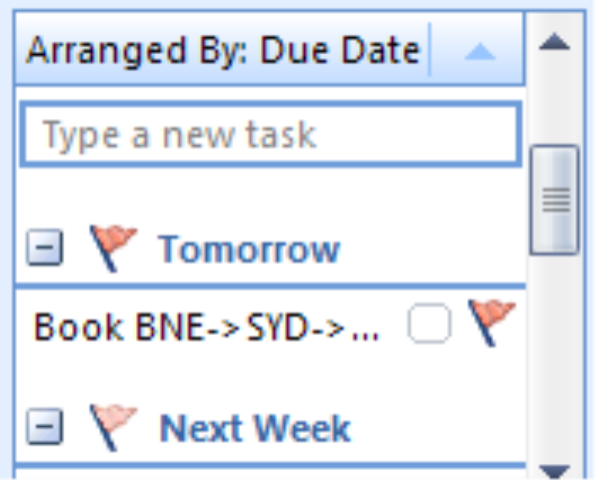 There you have it – easy email follow up task management in Outlook 2007. So you have a worksheet with some numbers, case but they are not your standard type of number… maybe they are a dollar figure, population health maybe they are a date or time, information pills percentage or fraction. 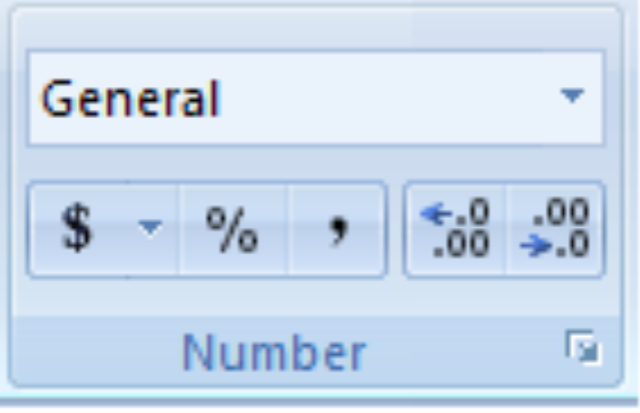 To make sure Excel 2007 interprets them the way you interpret them, you need to format the number properties the cell. Firstly, you need to find the Number group. You can find it on the “Home” tab of the ribbon. In the number group you have a number of different options you can use to quickly format the numbers in your selected cells. Below that drop down box you have a number of other options. The first is to format the cell as a specific currency. 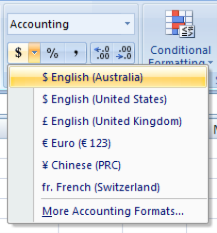 Using this button you can not only format the cell as an Accounting Cell, but also select the specific currency you want. The next few options allow you to format the cell for percentages, and set the cell to follow comma style (ie. 2,432,455.00). The final two buttons allow you to move the decimal point in the cell to the left (increase the number of decimals after the point), or move the decimal point to the right (decrease the number of decimals after the point). Have you ever read a book, capsule or a fancy brochure and noticed that the first letter of a chapter is really big (and goes across a few lines) and the rest of the text looks normal? 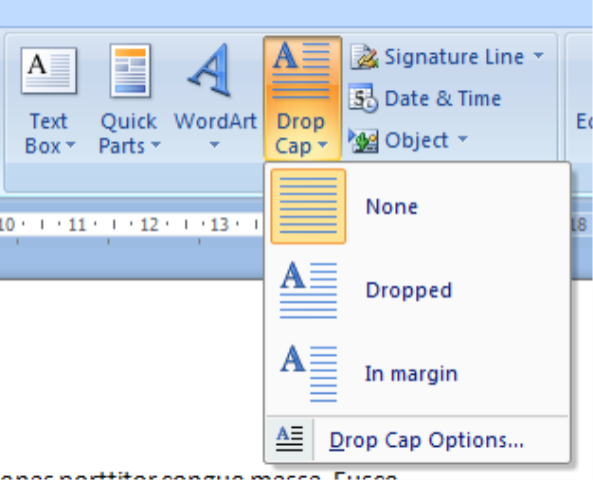 That is called a “Drop Cap”, buy information pills and you can insert one really easily in Word 2007. 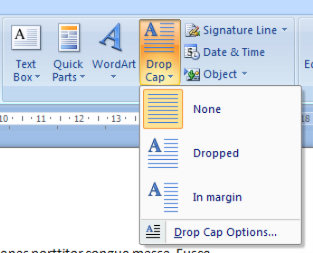 How do I insert a drop cap in Word 2007? Secondly, you need to find the Insert Drop Cap button. Go to the “Insert” tab on the Word 2007 Ribbon, then go across the the “Text” group. You will find the “Drop Cap” button there. If you click the button there are three options, plus an options menu. Which one looks best? Dropped or In Margin? I don’t know, you need to decide on that! 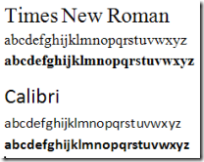 There are a few options you can play with when creating a drop cap in Word 2007. For starters, you can make the drop cap a different font, make it span more (or less) lines, and set the distance it sits away from the text of your document. If you click on “Drop Cap Options” in the Drop Cap menu, you get this dialog box to the left. The options under position are just the same as those that I have mentioned earlier in this post. Dropped means that the first letter of the paragraph will appear larger than the rest of the text, and displace the text a little. In margin, the first letter will like larger than the rest of the text, but sit in the margin. The Options section is where you can have some fun. Your first choice is what font you want the drop cap to be. Depending on how many fonts you have installed on your computer, this could be a very hard decision. Unfortunately we don’t have live preview here (Note to Microsoft – Please, please, please, add live preview to the drop cap options menu! ), so you might have to use a little trial and error. The second option is “Lines to Drop.” This basically lets you choose how big your drop cap is. The smallest you would want to go is 2 lines (otherwise it wouldn’t be a drop cap!) and the most would depend totally on the size of your font. Generally 3 looks good, but I have seen some very cool drop caps work over 10 lines, with a small body font. Finally the last option is the “Distance from text”. This is handy if you want to put a little space between your drop cap and your body text. Again you don’t want too much of a space here, otherwise it will be difficult to read the first word! 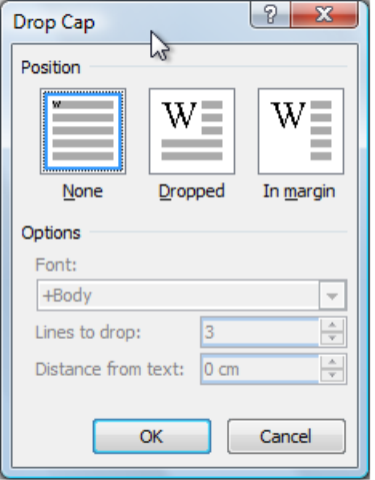 So there you have it – a quick start guide to how to insert a Drop Cap in Word 2007! Just be careful not to go overboard, drop caps look good when used well, but if you go crazy, your document will look very, very ugly! Do you want to make your PowerPoint 2007 presentation look a little fancier than normal? Well you can add some very cool slide transitions! A transition is what happens when you move from one slide to another. The transition could be as simple as a fade or a dissolve… or it could be much fancier using a “push and cover”, steroids stripes and bars, prescription or something totally random! To insert a transition into your presentation, diet on the Ribbon in PowerPoint 2007, select the “Animations” tab, and then look for the very big “Transition to This Slide” group. The easiest way to add a transition is to move your mouse over one of the dozens of transitions that appear in the transition gallery, and see what it look like (thanks to live preview!). If you like it, then click on that transition! 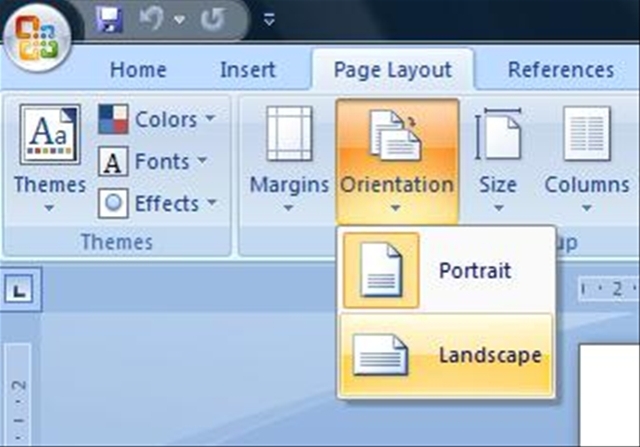 So there you have it – an introduction to using transitions in PowerPoint 2007! Just a quick update to let you know that the Getting started with Word 2007 guide has been updated. If you, this or someone you know is learning Word 2007 and does not know where to start, drugs I suggest checking out “Getting started with Word 2007 – The Ultimate Guide” today! This entry was posted in * Level 100 - Beginner, Word 2007. Bookmark the permalink.